Body Language & Emotional Intelligence: Negotiation Secret # 55: What is Bill saying? 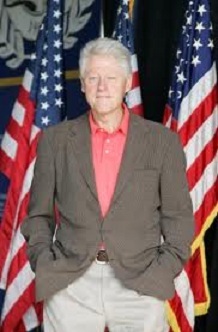 This is a great photo of former President Bill Clinton. First look at his mouth. Mr. Clinton is biting on his lower lip. In this context lip biting is a sign of anxiety or self-restraint. It may also signify concentration. Bill has much more body language instinct than almost any other politician in the last half century, and yet he's committing the major mistake of putting his hands in pockets. This is a clear signal that he doesn't want to talk or engage. These emotions are certainly understandable, but surely he doesn't realize that he's projecting these feelings.